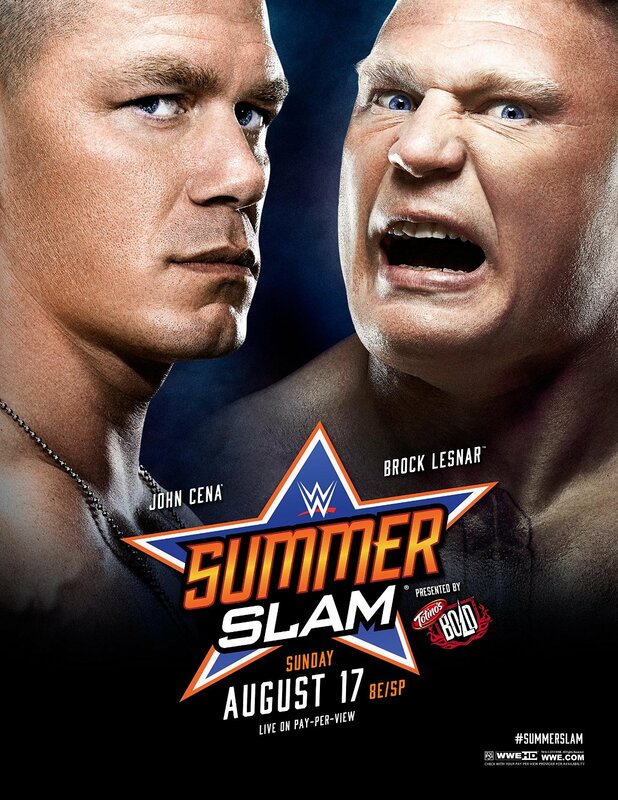 The biggest Pay Per View since Wrestlemania took place last night, the yearly summer spectacle Summer Slam. This year there was an expectation that it’d seeing the end of John Cena’s latest title run to the beast Brock Lesnar. The PPV in general had some rather tasty matches scheduled, and the overall result at the end of the night didn’t disappoint. The PPV in my eyes was one of the best in a while with each match capturing our attention, the only one match that I didn’t get fully into was the Bray Wyatt vs Jericho Match. In terms of kickoff shows, this one was pretty darned decent. RVD and Cesaro have featured heavily in recent title run-ins and matchups, so to have them starting was a treat. The crowd were into this match too. Recently Cesaro’s been on bad form, his apparent push seems to be on hold and he can’t buy a win lately. This trend continued on the show with RVD picking the victory up after a less than perfect 5 star frog splash. Good match to start with, shame on the result though as it keeps Cesaro on a downward spiral. What an awesome way to start the PPV off with. Miz came down and shot a promo claiming more how much of a hollywood A Lister he is, with a dig at the Rock and his upcoming movie. Ziggler came out after to a huge crowd pop. People really want this guy to go further in WWE. Fortunately they wouldn’t have to wait long. The match was pretty quick but both guys put on an awesome show selling each other’s moves. Ziggler looked down and out, but kicked out after the Miz hit his finisher. Eventually Ziggler hit a Zig Zag which Miz sold like an oscar worthy actor and won by pinfall. Huge crowd pop again. I didn’t have this down as a Ziggler win, I thought it’d be too soon to switch the belts, but this was a brilliant result to start the PPV officially. 2 title matches in a row. Previously AJ & Paige have put on some of the finest Diva matches the division has had in a while. This trend would continue as they fought again. It was a very physical match. AJ Lee diving from the turnbuckle out of the ring to clothesline Paige looked amazing. The physicality continued in the ring with Paige landing a painful looking DDT. Again another result I had wrong, I had AJ winning this, But I was happy to see Paige get the title again. There were rumours that Paige hadn’t been impressing much back stage and this was the reason for her title reign ending to AJ, but the division really only have these 2 at the moment worthy of the title, so it’ll be good to see this feud continue on. Next up is the continuation of the cold war story between Rusev & Swagger. The match didn’t get off to an official start, and Swagger locked the patriot lock in on Rusev before the bell had even rung. This set up the angle that Rusev was injured. Credit due here, Rusev continued this match entirely playing the injured ankle card. He limped, hobbled and struggled to walk making the Patriot lock that Swagger applied before the official start seem it really did damage. He kept this up the whole match even when trying to apply his submission finisher, instead of applying it he backed out due to it hurting his ankle. So good work on that. The match was entertaining as all the previous encounters have been. However WWE are still not ready to let this streak of Rusevs die, but they also don’t want Swagger losing in a clean loss. Last time they met Swagger lost by count out of the ring, This time Swagger lost due to passing out. Rusev eventually applied his submission finisher, but rather than tap out with the crowd chanting USA USA, Swagger just passed out from the finisher. The ref stopping the fight and proclaiming that Rusev is the winner. It’s 2 PPV losses for Swagger, but they aren’t clean pin losses so they’ll probably keep this cold war going a little longer. Better late than never, finally these 2 guys can get their hands on each other. This is going down as one of the greatest rivalries in a long while in WWE. The action kicked off as soon as both guys were in the ring, locking in a series of body shots. Rollins was first to leave the ring only to then be thrown back in by the Lumberjacks outside. When Ambrose got thrown out he was on the receiving end of a few kicks while he was down before being thrown back in. The havoc soon went out of the ring as the lumberjacks did a lousy job. Ambrose supper-plexed Rollins into a group of them and it was like a bowling effect. The 2 guys brawled all through the crowd, but eventually Ambrose was carried back in. Corporate Kane came out angry at the lack of discipline the match, Rollins trying to make a break for it was cornered off and brought back to the ring. Kane interfered which caused Goldust to react and retaliate against Kane, then all heck broke loose and the lumberjacks all entered the ring. Amid the chaos Rollins got hold of his money in the bank case and struck Ambrose followed by a win by pinfall. It was an awesome and frantic match. There’s probably a lot more to this rivalry too. This match really should have been on before the Lumberjack match. Unfortunately it killed the buzz from the last match, and it didn’t really excite. Bray delivered the sister Abigail to Jericho out on the walls outside the ring. Jericho got a spot to apply the walls of Jericho but Bray managed to reach the rope to break the hold. The match was one with a sister Abigail delivered and Bray picked up his first PPV win for a while. Normally I’ve got time to Bray and Jericho, but this match stopped all momentum from the last match and was a bit of a slow burner. Another excellent match advertising the Diva’s division, but just a shame that Steph won’t be in it again after this match. Again another very physical diva’s match with some hard hitting moves. Triple H came to ringside only to be hit by Brie Bella which got a good reaction. Nikki was also at ring side to assist Brie. With HHH out, Brie stood at one side of the ring, Nikki at the other… Steph looked out numbered, but a heel turn came about and Nikki Bella attacked her own sister to leave Steph to deliver a pedigree and win the match. Very odd heel turn given Nikki’s fiancé is Mr Face John Cena. Decent match, enjoyed it, but by this point all I could think of was the main event. Orton and Reigns are both great wrestlers at different ends of their WWE careers. Reigns will be champion sooner rather than later, and Orton has been an exceptional wrestler for WWE. He’ll win more gold before he’s done, but this match was more of a statement and perhaps a “passing of the torch” kind of match. Unfortunately it was another case of the match prior to this taking the crowds momentum and excitement and not quite giving this one their full appreciation. A great spot with Orton trying to hit RKO, Reigns countered and threw Orton towards the ropes, setting his site on a spear, Orton dodged this and managed to land an RKO and go for the pin. It looked great, but Reigns kicked out. Another attempted spear saw Orton with quick reactions to counter and slam Reigns to the ring. We were fortunate enough to see a rather awesome looking superman punch which made a hell of a connection. Reigns eventually hit the spear and that was lights out for the viper. A very important win for Reigns in terms of where he is and what he could be. I think we were all aware that Brock Lesnar would be winning the WWE title here, but the shock of this match was a the relative ease and speed he did it. Within the first 30 seconds Brock delivered and F5 which had the crowd pretty shocked but also rocking. This match felt really different to other title fights, it felt a lot more important. Strange I know. Cena barely had any offense on Brock. A few stomach punches, but he was bombarded by belly to back suplexes over and over again. One highlight was seeing Brock sit up after Cena’s best efforts and laugh at him. Cena attempted to apply the SFT, but Lesnar broke out of it and hit another F5 on Cena. And that was that, a straight 1-2-3… I had called that Cena would kick out there, but no… it was over… The Summer of Brock Lesnar is on us. How they’ll have Rollins cash in on Brock is beyond me. Perhaps they’ll have Brock drop the title before they consider having Rollins cash in. All that matters is that Brock well and truly owned John Cena in this match. The Cameras panned to shocked viewers in the crowd similar to the moment Brock beat Undertaker. This wasn’t that big or shocking, but still felt like it was over very quick. It was a very strong PPV, and provides a lot of excitement going forward with the likes of Ziggler and Paige in rivalries for their gold. Who is big enough to challenge Brock Lesnar now? Where will Rollins / Ambrose rivalry go now? I think it was only fitting that Brock beat Cena. I mean come one it’s Brock Lesnar. If Cena would have beat him I would have lost all faith in the WWE. I think they’re taking Brock back to his younger days. When he first came out he acted very similar to the way he does know. Love or hate the guy he is a beast in the ring.